Running parachutes are an effective tool for improving both running speed and strength. Chutes are most often used by sprinters, although runners of all types can utilize them in their training. Most chutes are made of cloth and are attached by cords to a harness system that is worn by the runner. As the runner picks up speed, the chute fills with air and provides resistance that makes the runner work harder. The faster you run, the more resistance you feel. Chutes are best employed during interval training on a track or flat course, during which a runner does several repetitions of speed work. Run 20-meter sprints. Begin with a standing start and sprint 20 meters, allowing the parachute to fill behind you to increase drag. Then slowly jog for 20 meters as the chute deflates and drag decreases. 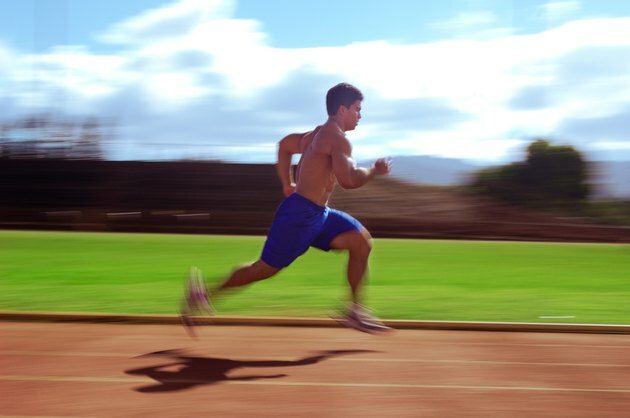 Sprint the next 20 meters and repeat the interval until your leg muscles begin to fatigue. This relatively short sprint is a good preliminary workout before you begin more sustained and difficult parachute exercises. Run a 100-meter dash with a rolling start. Begin by running for about 10 meters, building up speed until you reach a sprint. Then sprint for 100 meters, or about the length of a football field, allowing the chute to fill up with air and create resistance. Slow down to a jog for 100 meters and then repeat the interval as many times as you like until muscle fatigue starts to set in. Run 400 meters at a comfortably fast pace. From a standing start, begin running until you are nearly at a sprint. As you pick up speed, the chute will create more resistance behind you. A 400-meter run--or one lap around a track--gives you enough distance to sustain that wind resistance in the chute, effectively building leg muscles and speed. What Are the Benefits of Sprinting?